Taken from a farm in Gloucester our lovely Colchester 560/4EK on Thursday 10th December. Identity No. SGFS000FL4C000492. Last year we took all contents out of the caravan but we had not got around to doing it this year. Some of the contents washing machine, microwave, freeview, combi tv, dvd player, awning, chairs, tables I could go on forever. We are completely gutted and had locks etc., very determined theives as the track marks going out of the farm showed. Police have done nothing so relying on general public for help. Crime reference number 039366/09. 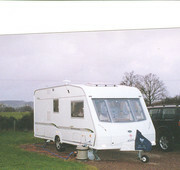 Our caravan was stolen on 30th january 2009. It is a Bailey Pageant Burgundy 2007 not quite 2yrs old. SERIAL NO SGBSJ06BY70700217. Unfortunately everything was inside. It has been reported as stolen but after 24 hrs the police have filed the case, lack of any new evidence. It was fitted with an alarm, hitchlock and wheelclamp. Scotland badge on front under front windows – if removed would leave a mark but could easily be replaced with another badge.Small cracks on front locker where the key is inserted.Pin dents on door side where our awning came down last year.Odd blind in front window – on left if you where facing the Caravan. This blind looks almost pink tint where as the other blinds are silver. This pink blind never fitted properly and looks almost creased.Odd wheel on door side – We had a blow out and put a Rover Alloy on. The rover badge was displayed.Inside where a Silver portable TV/Video, Built in CD Player, Digi Box, many personal items, all usual cutlery, pots and pans etc, towels, bedding, sleeping bags, two new chairs one blue and one green with foot rests, clothes, toiletries plus much more.Canopy awning with sides in side locker – new this year.Water butts, aqua roll, dogs bowls, Ariel on pole lay on floor inside black tape round the poles.Orange, Green and Gold cushions on sofas.Large bathroom to rear with walk in shower cubicle. Bathroom cupboards are Turquoise with white handles. Stolen from my bungalow in feltwell in norfolk on the 29/08/2008 at 05.15 am ,the car was towing the caravan was a sliver estate car , no id of the car. The make of the caravan is a bailey senator 9000 ,year of make 1994. 2003 Bailey Pageant Moselle (VIN SGBSC07BY3030246). My son-in-law and daughter bought a 2003 Bailey Pageant Moselle last year after a few years tenting. Their two children loved it, too. They've gone off to France today - unfortunately with a borrowed tent in a trailer as they discovered the caravan had been stolen when they went to the "safe" compound near Totton Southampton last night. Despite the locked gates, the hitchlock, wheel clamps, CRiS registration, etched windows, etcetera, it was taken between 4th and 19th August. Fully equipped and with a Dorema full size red awning, possibly been taken out of the country. This is a five berth twin dinette, CRIS registered. Any information would be gratefully received. Our Abbey GTS Vogue 418 was stolen last night (22 Apr 2008) from our garden in Somerset (BA22 8JE). Its a 2004 model VIN SDGS004SW40803164 with some distinctive mods inside: fixed bed base modified to take full rectangular mattress rather than usual corner cut off. Bathroom door converted to bi-fold and extra power point front left seat front. Also slight dents and scrape to body above front windows on nearside. Van has Powr Touch mover system. Police CRIS etc informed. Grateful for any help. Can anyone help please we are a family who have no savings now as we blew it all on buying a brand new fleetwood sonata prelude 6 birth on 21st July 2006 from south wales caravans in Treorchy. Whilst we had the caravan we was away in it all the time over the weekends, school hols, Xmas and the new year etc it was stolen despite being locked and all security equipment being in place in may 2007 from behind our friends house in a town called Blaina South Wales where we live. Inside the caravan was all our possessions kids bikes, 2 digital cameras, photo's of my wife and kids at our renewal of our wedding vows (which cannot be replaced as memory card was in camera) T.V, DVD player, freeview box, bike rack, loads of clothes including a new design asda uniform where i worked. There was a awning and groundsheet also. All the caravan documents was inside the caravan except the registration document. We only returned home from staying away in it that day on the night it was stolen the registration on the caravan was BJ51 UGN we was unable to get the caravan to our insurance stated storage address due to it being late so we got it as close as possible. On the rear drivers side of the caravan had been bumped and was just sealed up on a temporary fix and on the driver side of the caravan there was some scratches from the trees and on the passenger side where the door is there are several scratches from the awning poles. Also inside the caravan the worktop by the sink and the main dining table had a dent in it. Unfortunately our insurance will not pay us due to it not being at the storage address at the time of theft, so we are begging anyone who has any information with regards to this theft to come forward and we will pay a reward for any information that may lead us to finding our caravan. We upgraded from our older, much smaller caravan to this one. It needed some work and TLC and we had almost completed the task. This caravan was our pride and joy and was kept safely as we thought in our garden, however on 11/01/08 someone came into our garden at night through the adjacent Pub car park and dismantled the fence and towed it away. We had even taken off the tow hitch and had it chained up for extra security, but to no avail as the thieves must have come prepared. There is a crack to the casing to the tow bar on the front of the caravan, also the flap over the electric hook up has the bottom right corner snapped off and a crack in the back window by the door. There is also a saucepan scold mark on the worktop to the right of the cooker, the door to the drink's cabinet has the glass missing and it has a brand new freestanding cooker and halogen fire. It was also fully loaded when it was stolen complete with TV, DVD, CD player, awning, tool box/tools, loungers and folding table. The caravan was stolen from the village of Marsh Gibbon, Oxfordshire on 11th January 2008 in the early hours. Contact: Thames Valley Police on 0845 850 5505 or Arthur on 07849928520 or Jill on 07704533717.
restore a great bit of history to it's former glory. someone out there spots it! confidence) or to Corby Police on 01536 207660 (crime ref. Burstner ventana 500 ts single axle. Burstner ventana 500 ts single axle. it was stolen last night from Copdock Near Ipswich. theives cut through security lock on gate also removing the wheel clamp and hitch lock, the gentle man had left all the books and registration details in the caravan, the caravan was fully loaded after his holiday.the caravan was stolen at 11.10 pm from storage site.if anybody is offered this caravan or knows were it is can you please contact 01473 730913, a reward is offered for safe return. Stolen from Lenborough, Buckingham, Bucks early hours of November 25th 2007. CRIS Vin number SGDTT4ASW70324686. Crime reference number AG9853423-07Caravan had a Bulldog wheel disc on each of the axles near side wheels. It also had an AL-KO hitchlock fitted. All corner legs were down and it had a Protec green cover fitted.To take the caravan, the thieves broke the padlock on the five bar gate and lifted it off it's hinges to open it. They then removed the cover, somehow removed both wheel locks and the hitch lock. The marks on the grass then suggest that they manhandled it round and out of the gate prior to hitching it onto a vehicle. Broken wheel locks and hitch lock were taken away by the thieves, with only small scrapings/chips remaining on the grass.Caravan is as new and has only been used for 6 nights since new. Only distinguishing mark is a very slight graze/crease on the upper off-side about 4 feet long and two thirds of the way back. This being caused by a tree branch. This is not a scratch, more of a slight distortion of the flat aluminium side panel.The grey plastic cap that screws on top of the heater roof mounted vent pipe was pulled off when they removed the caravan cover. And if they haven't removed it, on the upper near side toward the rear, there is a plastic bracket fixed to the side of the caravan with two 10'ish horizontal strips of black tank tape where the external TV aerial clipped on (see photo).As you would expect, various items were still in the caravan including two awnings, external TV aerial, water container, waste container, tool kit in plastic case, fishing rod/reel kit, two sets of Hunter wellingtons in Hunter bag etc etc. white single axle first registered with CRIS 2005. VIN No SGDS004SW40806425. The Reg No on the rear of the van was M12 CHJ. the site on CCTV but as they had the main beam on their car, and covered the number plates, no registration was visible. Also they used the sun visors to hide their faces.Distinguishing features are a slight crease above the "525 SL" lettering on the top right hand side of the door where one of the awning poles slipped against it. There was a split in the skirt on the A frame. additional panelling was fitted to make it look tidy.
. Stolen from a “secure” compound just outside Stafford at the junction of the A51 and A518. This was our first caravan bought locally and was being stored at the same site it had been stored at for many years by it’s previous owner! My wife and children are truly mortified that when I went to collect it at 6pm tonight (1st August 2007) for a long awaited holiday, we found it had been stolen from the compound. I am lead to believe it has been stolen within the last 7 days!! Distinguishing features are few from other models of the same type, but it does have an additional external 240V socket fitted on the same side as the door and also has a wheel trim missing. Inside was an almost new Awning by NR Awnings, and all fittings ready for use. The colouring on the bottom edge of the van has slight smudging due to someone trying to clean with some kind of thinners in places, but other than that, there are few other things to identify it! Interior was a faded burgundy colour but in very good overall condition. Compass Rallye 534 2002 VIN SGES000EX2RAF0037. Whilst travelling to the Isle of Wight and with the intention of stopping over, they stopped at Sutton Scotney Services southbound on the A34 (Winchester). They went to get food from the restaurant, when they returned, it had been taken off the back of the car, the van was locked on so we are not sure how it was removed. Obviously the caravan was fully laden with 2 weeks holiday clothes and belongings, and as well as the usual tv, microwave, digital camera etc that can be replaced by insurance, there were many personal effects that cannot be replaced (photo's, gifts etc). They have now continued on to the Isle of Wight so that they don't lose thier holiday money, but obviously, the situaton has led then to have to replace everything, clothes, food, toiletries, bedding etc. The van details are (apologies for lack of VIN no, they can not get this to me until they return and I have no photo's) Lunar Rendezvous 2004 twin axle, end bed. It has (or had) a bike rack (with bikes) with if removed, will leave distinctive holes. There are several dents around the door where the keys have marked it when the door has been opened. There are two dents in the work surfaces, one next to the sink, and one under the drinks cabinet. The outer door catch has been heavily glued and is noticeable. My caravan was stolen from a caravan storage farm in rugby west midlands on Saturday 17 March early morning, we hadn't had it long, we bought it last year for the summer, we went there last weekend and got it ready for using next week end we were going to take my two disabled sons away for the weekend. the caravan is a AVONDALE ARGENTE 640-6 year 2005 vin number SGAT000AV50001480 we hadn't had a caravan before this was our pride and joy for my sons and my husband and myself. we cannot go away again until we get some thing else i don't know how long the insurance will take. Two others went as well police said for us to go and find the gypsy site and see if it was there but that is there job not ours they wont go to them their selves. If any one come across this please contact me by email mrgrt_montgomery@msn.com. or Coventry police on 02476 483418. 2005 model Ace Supreme Twinstar (VIN No SGDT005SW50312047) stolen from Moreton Valence site at 01.30 hrs on Saturday 13th January 2007. The thieves broke through the locked access gate, went round the site to scope the best caravan to steal then proceeded to work on the security locks on my van. They appeared to jack the "quality" wheel clamp apart from behind the wheels and somehow bend the top arm around over the top of the wheel. There was an al-ko hitch lock on the front. The thieves appeared to lever the sides of the hitch lock upwards and sideways probably using some purpose made bar. I haven't found the rear stabiliser padlocks. They then broke into the caravan and I assume broke the alarm and tracking system. I got a call at about 1.15 in the morning at home but slept through it. The message in the morning was that there was a "power down" of the tracking system. All this was picked up on CCTV but unfortunately not very clear. All this took about 45 minutes. This is information to let you know how the theft was done. If you know of anything please contact Phil on 07798 848474 or Gloucestershire police on 0845 090 1234. Thieves removed Hitch lock and wheel lock cut electrical supply mains. Ok Guys, Some good news 8.30 tonight 09-01-07 I received a phone call from the police to inform me that my caravan had been found in Norfolk. Apparently hitched to a vehicle and being towed at the time of capture. Discovered with the aid of vehicle recognition cameras. I will tell you more when I have had the opportunity to gleen info from the police tomorrow after I collect my caravan. Thank you all for your support here mail received and a big thank you to Eric for allowing me to post in his forum. Stolen from Thornton's Holt Storage/Camp site in Nottingham between 20-23rd November following removal of wheelclamp/hitchlock. This unusual van has green/cream upholstery and dark red loose fitting carpets. As the thieves are reported to have towed it through a fence and hedge the exterior may have sustained some damage. The van was fully loaded and sadly all documentation for it was with the van when stolen and therefore it may be offered for sale. Stolen from our garage in Corringham Essex It folds down to a trailer which is white with Pennine on the gas bottle compartment and Sterling 510 on the side. There is small damage to the door and also the plastic by the jockey wheel.